Dr Jason Scott has a Ph.D. in Film Studies from Sheffield Hallam University. His thesis focussed on aesthetic innovation in the Hollywood Renaissance film Bonnie and Clyde. 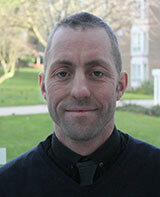 He has taught both Media Studies and Film Studies at Leeds Trinity since 2006. Prior to his appointment at Leeds Trinity he taught undergraduate and postgraduate Film Studies and Media Studies modules, as an Associate Lecturer in Film Studies, at Sheffield Hallam University, for 6 years, and concurrently undergraduate Film modules within English at Sheffield University for 3 years. He is currently writing a book, The Character-Oriented Franchise. This relates to both film franchises and links to pre-sold characters from books, comic strips, games and cartoons, and synergies with other media products and merchandising. Prior to my appointment at Leeds Trinity I taught undergraduate and postgraduate Film Studies and Media Studies modules, as an Associate Lecturer in Film Studies, at Sheffield Hallam University, from February 2000. I also contemporaneously taught as a part-time visiting lecturer at Sheffield University, teaching on the ‘film track’ within the English department from September 2003. Within my teaching at Sheffield Hallam I began to make use of their VLE, Blackboard, as a portal for utilising online resources for studying film controversies. I have continued to make use of Moodle with audiovisual resources at Leeds Trinity. I have also been module co-ordinator of both undergraduate and postgraduate courses at Sheffield Hallam University, and module co-ordinator at Leeds Trinity for the undergraduate modules Film Analysis 1, Perspectives in Film Studies, Media Theory 2, Understanding Disney, Film and Television Adaptation, Film Analysis 3: European Cinemas, Film Research A and Film Research B. I completed the PGCLTHE course to develop my higher education teaching skills. I peer review articles for the MECCSA journal Networking Knowledge and have peer-reviewed books for Continuum. · British, American or European Cinema. I am currently continuing research on the character-oriented franchise in film and related media. This year, this is focused on Disney and its perennial (re-)adaptations, as well as franchise adaptations and transmedia branding, and contemporary animation. I am continuing to revise and expand my recent conference papers and journal articles that have not yet been accepted: these include: “Disney and the perennial (re)-Adaptation of pre-sold stories and characters”, and “The ever shifting contexts of the contemporary British independent film producer: Mark Herbert and Warp Films, a case study”. My main research is intended to develop into a book The Character-Oriented Franchise. This relates to more focussed research on the character-oriented franchise in Hollywood cinema, which whilst focused on the history of this mode of filmmaking also addresses the links to pre-sold characters from books, comic strips, games and cartoons, and synergies with other media products and merchandising. I work part-time, 0.6 of Full Time or 3 days per week, and am generally on-campus on Tuesdays and Fridays, and some Mondays or Wednesdays when I have meetings. My office hours are publicised outside my Office, C27 in Concorde. Programme lead tutor for English and Film since September 2010. MFC Research co-ordinator from September 2009 until August 2013, organising MFC Research seminars, contributing to MFC departmental research strategy and leading REF submission for Media panel. I was Open Day co-ordinator for the department of Media, Film and Culture from August 2007 to February 2009. I remain a member of the Open Day team. I was a member of the Moodle support team for the faculty of Media, Business and Marketing from March 2008. I was an (internal) external member of the Faculty Quality and Standards Committee for the Faculty of Education from September 2008 until FQSCs were abolished. I am a member of the Departmental Academic Committee for MFC and then Journalism, Media and Business, since October 2011 (for new department from September 2012). I am a member of the Departmental Research Ethics Panel, from March 2014. I was an elected member of the Academic Board from September 2008 to May 2012.